70% Give or take a percentage point or two. Did I Mention I Am a Slow Learner? It's mild today (about 35 °(f), with mild winds, so I went out to the terrace to bring in the bags of potting soil. They are now sitting near a radiator, thawing out and warming up. 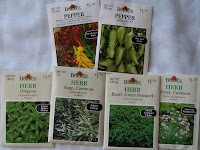 As soon as the soil is warm, I’ll start some new fresh herbs.. I have some chives and parsley that have successfully wintered over, but I’m not sure that I can ever have too much in the way of either--same goes for Basil. I start basil seeds in various pots/window boxes over a 4 month period. That way, I can harvest some, and give the plants a chance to recoup. I end up with some big plants, and some small ones--either because they are seedlings, or recently pruned. Basil is cheap enough to buy, but sometimes you just want a leaf or two RIGHT NOW--and there is nothing as wonderful as fresh basil from your windowsill! I don’t know how much success I’ll have with the peppers, (pollinators are scare on the 14th floor--not to mention, my terrace is screened!) but maybe I can remember to pollinate them myself with Q-tips. Fresh (or dried) peppers are good to have on hand too! I have to start checking on Hicks, too. Any day now, they will be having there Pre-season sale on summer annuals. Years ago, they use to run full page ads in the NYTimes every other week or so, but now I am forced to buy a LI paper, or just stop by. What I love about the “pre-season” sale are the small geraniums--each plant for 49¢ --or a flat of 24 for $8--These need to sit on a sunny window for a while, and then to be hardened off in a mini greenhouse out doors (and some nights, brought in!) before they can be set out in window boxes, but they are first quality plants, and last year, gave me blooms all summer. I remember buying them after in late February, and having beautiful plants by late April (April 19th is general considered the last day of frost in NYC). My terraces is somewhat protected, gets lots of afternoon sun, and the bricks act as a thermal mass, storing solar energy, and keeping the area slightly warmer than would otherwise be expected--so I don’t have to make a big effort to get them to grow. Here are just 2 of the 6 window boxes that I grew on my terrace last summer-- I always have mint plants too, and frequently other annuals from seed. Yay gardening! I have a lot to catch up on with you. I live on a mini farm, so I am always in awe of how city people garden.